Our first EHCP annual review is now behind us, and I have to say that I think it went ok (though I don't have much to compare it against and don't know what is best practice). As I wrote before, I had been worried about writing my parental views ahead of the meeting, however by the time of the meeting I had come to grips with the key points I wanted to discuss. Despite reading several online resources, and talking to SEND IAS, I wasn't too sure what to expect. The one thing that I was sure of was that I didn't want this to be a them vs. us meeting, and was determined to try make it as collaborative a session as possible. The session was attended by myself, my husband and the school SENCO. The school teacher had provided input on his progress, and our paediatrician had written in to confirm our Son's diagnosis. I was not too concerned about a lack of other professionals due to the level of support our Son is receiving at school, however we have asked that his SALT provide a report which can be integrated into his EHCP once complete. At the session we discussed our continued wish to see our son re-integrate into mainstream schooling before year 6, and our desire to understand why he is "below age expectations" across all areas of the school curriculum despite often being thought of as a "bright boy". It was interesting to note that wanting to achieve these academic outcomes above can't be stated in the EHCP, as they are not SMART enough to be considered as outcomes - they are aspirations. With this in mind, we focused on the specific things he needs to achieve or overcome in order to attain these aspirations. The discussion led to some new insights from the school about his needs which included challenges with visuospatial working memory, ideation and the ability to apply existing knowledge to solving new problems. The SENCO seemed confident that he is making the right progress to likely achieve the academic aspirations that we have which is great as our Son stated in his views that he wants to be scientist. He would also like to spend more time doing RM Easimaths. At least we know that our aspirations for him are not so different those he has for himself, however I doubt we can help him in his quest to "build superheroes". We also spoke about his engagement with his peers, and his ongoing need for control. It was heartening to note that he is starting to develop his social interactions (though not always in a positive way), and he is becoming more accepting of the need to compromise and negotiate. The work that they have been doing at school is starting to have an impact but he still has a way to go. Hence the need for increased SALT provisioning. Once we had talked about our aspirations and the various needs and challenges which were impacting our Son, we reviewed the EHCP outcomes. For each outcome, we discussed the progress made, the provisioning received, and the suggested next steps for the year ahead. For most of the existing outcomes, new wording was suggested by the SENCO to make the outcomes more specific or relevant to his current progress. In addition, new outcomes were suggested to capture the need to use ideation skills to synthesis new understanding. By the end we had an agreed set of outcomes that the school are going to put forward to the LA. We also have a much greater understanding of the work that they are doing with our Son, and a view of the longer term strategy that they are working towards. This time round we have definitely felt a much bigger part of the process, as we didn't talk through the outcomes during the EHCP needs assessment and were too exhausted to review or challenge them once the EHCP had been issued. Next time round, I think I will be much less anxious about our parental views as I now know that the most important thing for us to consider is our aspirations. Until then, I am keen to understand more of the needs that have recently been highlighted by the school, so that I can understand the full extent of these needs and the likely impact they could have on my Son's future. As part of our review I came across a few resources that were useful, and which helped in the planning for the review. 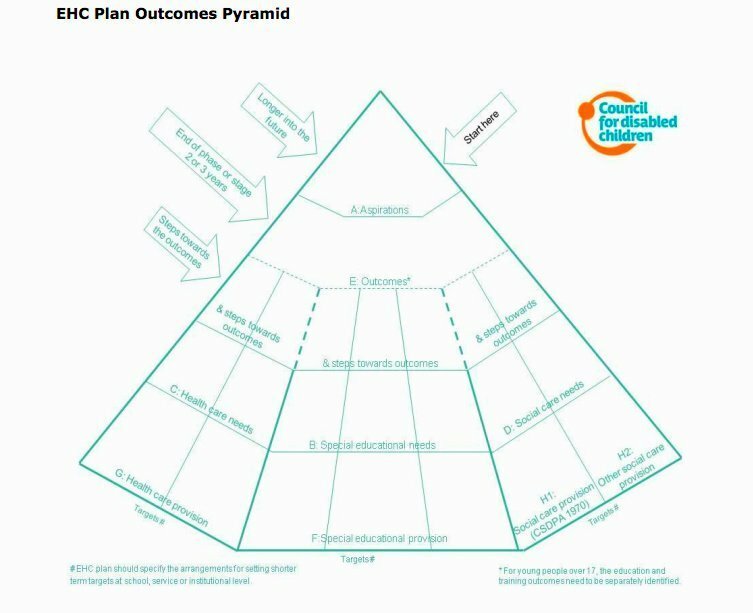 The EHC Plan outcomes pyramid by the Council for disabled children is great at helping to structure thinking in terms of turning aspirations into outcomes to address specific needs using stated provisioning. The SEN NAV cards by Olga Hamer, which reminded me of the wording to use to describe my Son's needs when trying to describe what we observe in terms of his needs.